Debunking the Thomson Reuters GFMS Gold Survey 2016 report. New information provides a more detailed perspective on the Chinese domestic gold market. In the Gold Survey 2016 report by GFMS that covers the global gold market for calendar year 2015 Chinese gold consumption was assessed at 867 tonnes. As Chinese wholesale demand, measured by withdrawals from Shanghai Gold Exchange designated vaults, accounted for 2,596 tonnes in 2015 the difference reached an extraordinary peak for the year. 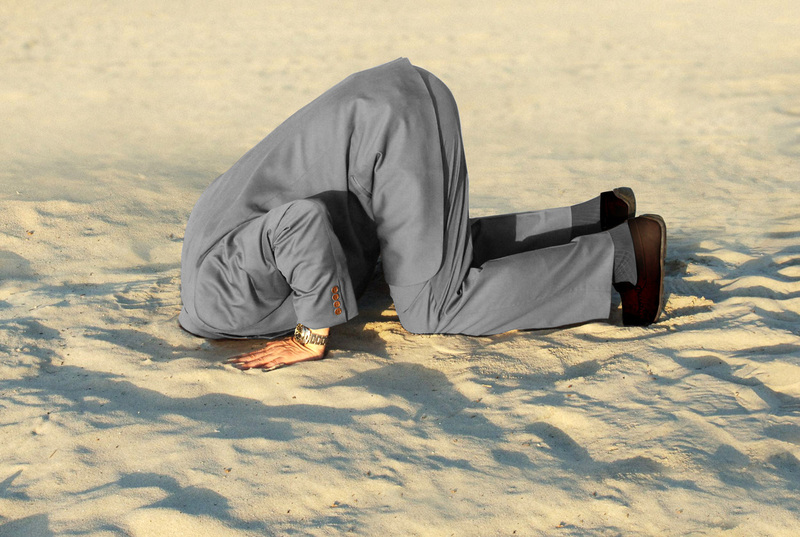 In an attempt to explain the 1,729 tonne gap GFMS presents three brand new (misleading) arguments in the Gold Survey 2016 and reused one old argument, while it abandoned five arguments previously put forward in Gold Survey reports and by GFMS employees at forums. Very few of all these arguments have ever proven to be valid, illustrated by the fact that GFMS perpetually keeps making up new ones, and thus gold investors around the world continue to be fooled about Chinese gold demand. For some reason GFMS is restrained in disclosing that any individual or institution in China can directly buy and withdraw gold at the Shanghai Gold Exchange, which is the most significant reason for the discrepancy in question. 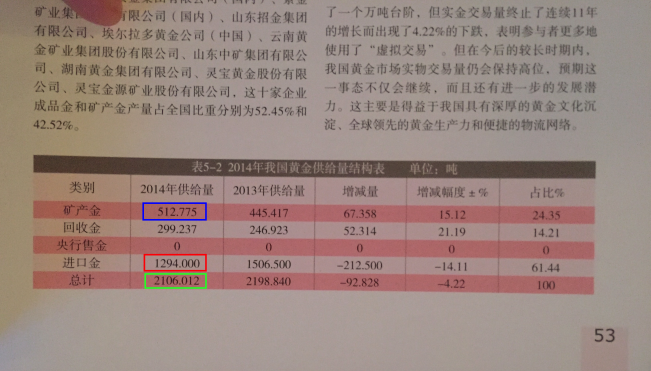 According to my estimates true Chinese gold demand in 2015 must have been north of 2,250 tonnes. The reason I keep writing about this subject (the discrepancy in question) is that it eventually will enable me to show that global physical gold supply and demand as presented by GFMS is just the tip of the iceberg. And, as stated in my previous post true physical supply and demand is far more relevant to the gold price than the numbers by GFMS. New Information has enabled me to shine a fresh light on the Chinese domestic gold market, so we’ll zoom in once again to get the best assessment of the mechanics of this market. 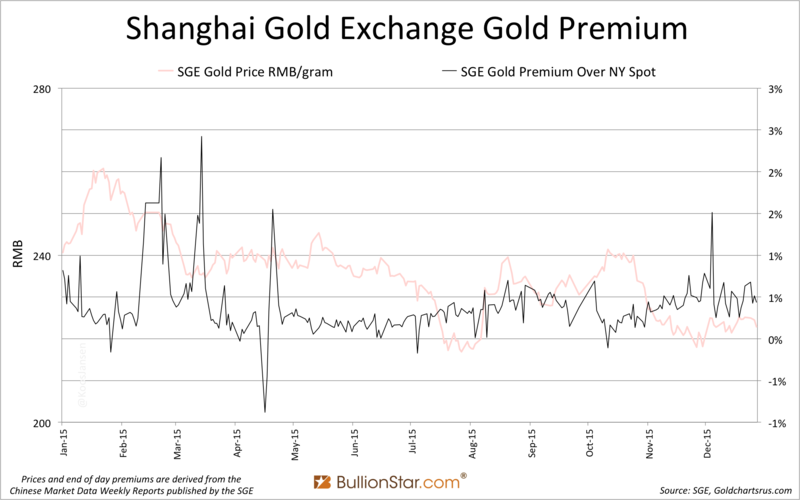 This post is part two of an overview of the Chinese gold market for 2015. 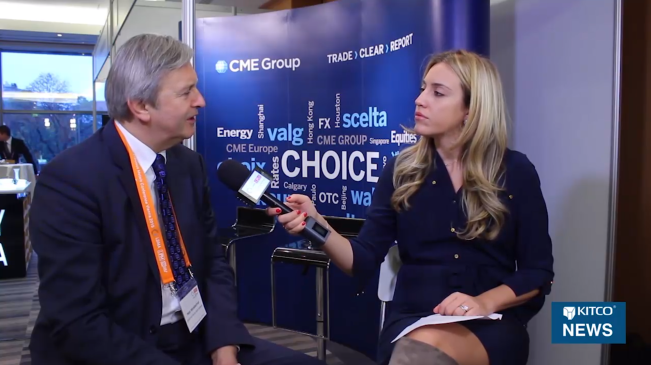 In the first part we focused on the (paper) volumes traded on the Shanghai Gold Exchange (SGE) and Shanghai International Gold Exchange (SGEI). In this post we’ll focus on the size and mechanics of the Chinese physical gold market, while at the same time addressing the fallacious information in the Gold Survey 2016 (GS2016). 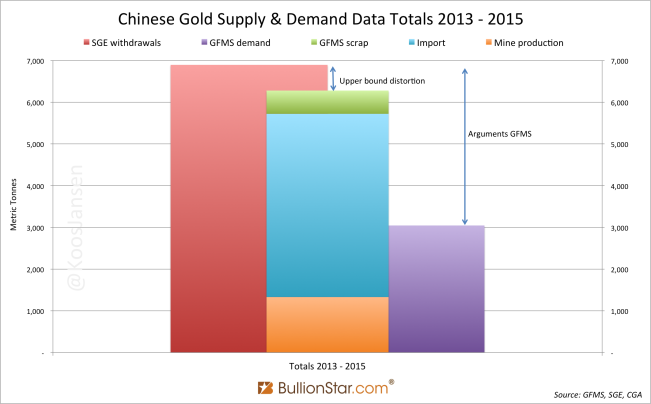 First, let’s have a look at an overview of the key supply and demand data points for 2013, 2014 and 2015, as disclosed in Gold Survey reports by GFMS. Without GFMS mentioning the volume of SGE withdrawals for 2015 (2,596 tonnes) in the GS2016 they disclose apparent supply in the Chinese domestic gold market at 2,293 tonnes. Mine output accounted for 458 tonnes (page 22), scrap supply for 225 tonnes (page 36) and net import was 1,610 tonnes (page 54). The latter is incorrect because GFMS has double counted 63 tonnes Australia exported to China, as demonstrated in my post Australia Customs Department Confirms BullionStar’s Analysis On Gold Export To China, but the let’s not nitpick. On other pages in the GS2016 we read total (consumer) demand for 2015 was 867 tonnes (page 52), consisting of retail bar demand at 199 tonnes (page 52) and gold fabrication at 668 tonnes (page 41). 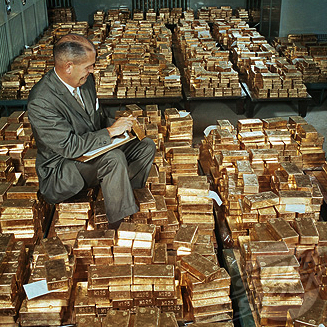 According to their own data there was a surplus of 1,426 tonnes (2,293 – 867) in the Chinese gold market. Whilst, in 2013 the surplus accounted for 826 tonnes and in 2014 for 917 tonnes, according to data disclosed in previous Gold Survey reports. Meaning, in the past three years GFMS has observed 3,169 tonnes (826 + 917 + 1,426) that were supplied to China not to meet demand, but for reasons that are constantly changing – wait till we get to the plea. Hong Kong remained the primary conduit of Chinese gold imports, though its share has been contracting since 2013 … Gold import from this conduit was traditionally regarded as a simple proxy to estimate Chinese consumption … The declining dominance of Hong Kong and the increasing proportion directly routed into Beijing and Shanghai therefore points to the necessity of changes on methodology to calculate Chinese gold demand. GFMS states that when all Chinese imports came in through Hong Kong this inflow was “regarded as a simple proxy to estimate Chinese consumption”, but now gold is also being imported directly from countries like Australia, the UK and Switzerland, such inflow “points to the necessity of changes on methodology to calculate Chinese gold demand”. 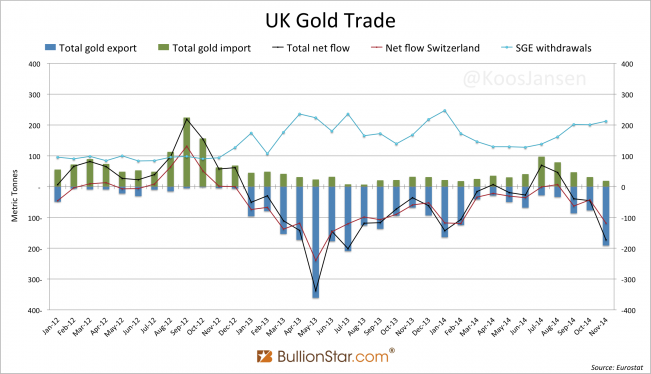 How can it be that a couple of years ago Chinese gold import from Hong Kong reflected demand, but a few years later direct massive additional import from the UK and Australia does not reflect demand? As you probably know (otherwise you can read it here) most of the gold supply in China flows through the SGE. Consequently wholesale demand can be measured by the amount of gold withdrawn from SGE designated vaults. Comparable to the difference between apparent supply and consumer demand shown in exhibit 1, is the difference between SGE withdrawals and consumer demand – the latter being even wider. In the GS2016 GFMS has written a chapter fully dedicated to the humongous difference between SGE withdrawals and their assessment of demand. The chapter is titled “A Review And Explanation Of How China’s SGE’s Withdraw Numbers Are Impacted By Other Trading Activities”. In this post we’ll only briefly discuss whether the arguments are valid, as one of them has to do with China’s highly complex VAT system and I like to expand on this subject in detail in a separated post. However, we’ll expose more of the mechanics of the Chinese domestic gold market in this post, which conveniently demonstrates why nearly all the arguments by GFMS that will be discussed later on are bogus. 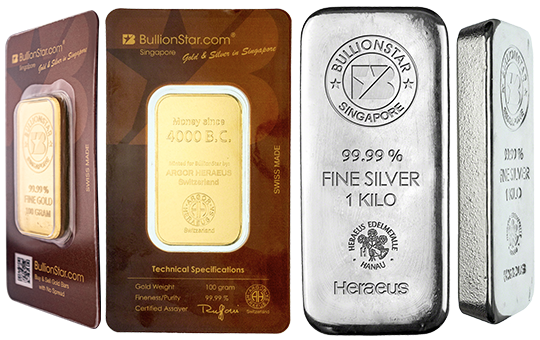 This might surprise you, but I actually had fruitful correspondence in the past months with a Senior Precious Metals Analyst at GFMS and a Senior Analyst at Metals Focus (MF). Both gentlemen have been very helpful in sharing their methodology for computing (Chinese) physical supply and demand data. I have to say both of them have answered all my questions. This service is seldom provided by the the World Gold Council, the Bank Of England or the London Bullion Market Association. Based on the information shared by GFMS and MF I’ve refined my view on our on-going disagreement with respect to the Chinese gold demand. 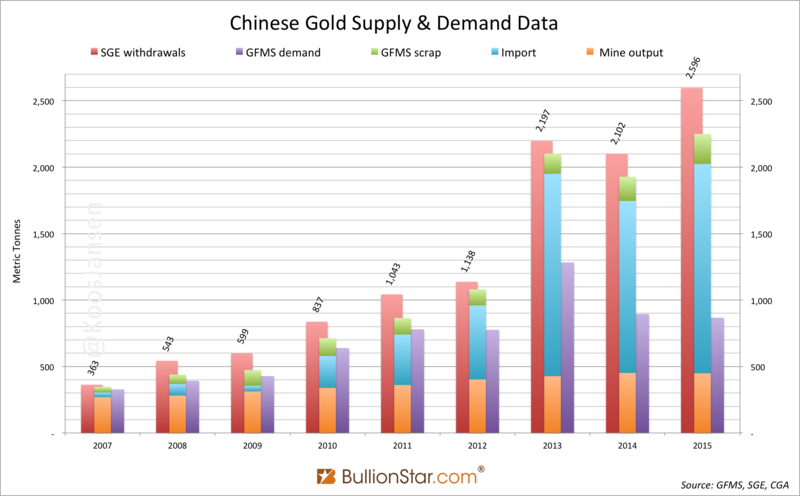 The Mechanics Of The Chinese Domestic Gold Market And Estimating True Chinese gold demand. Let us refresh our memory regarding the structure of this market. In the Chinese domestic gold market nearly all physical gold supply and demand flows through the SGE because all bullion import1 into the domestic market is required to be sold first through the SGE and there are rules and tax incentives that funnel nearly all domestic mine output and scrap supply through the central bourse. As gold in the Chinese domestic market is not allowed to be exported1, the amount of gold withdrawn from SGE designated vaults therefore serves as a decent indicator for wholesale demand. However, there are a few possibilities through which SGE withdrawals can be distorted for measuring demand. If metal is in some manner recycled2 through the central bourse. When gold is bought and withdrawn from the SGE vaults and promptly sold and deposited into SGE vaults (for example though process scrap), these flows would inflate SGE withdrawals while not having a net effect on the price of gold, hence the related supply and demand volumes would be deceiving. Although article 23 from the Detailed Rules for Physical Delivery Of the Shanghai Gold Exchange states that bars withdrawn from SGE designated vaults are not allowed to re-enter these vaults, this rule does not fully prevent gold from being recycled through the exchange. If bars withdrawn are re-melted and assayed by an SGE approved refinery they are allowed back into the vaults. And thus, some recycled gold can inflate SGE withdrawals as a measure for true demand. Another example that could distort SGE withdrawals is when international members would withdraw gold from vaults of the SGEI in the Shanghai Free Trade Zone2 (SFTZ), these withdrawals are included in the total SGE withdrawal figure, to store elsewhere in the SFTZ or export abroad1. For ease of reference we’ll label the amount of gold recycled through the SGE that has no net effect on the price, and gold withdrawn from SGEI vaults that is not imported into the Chinese domestic market as distortion2. 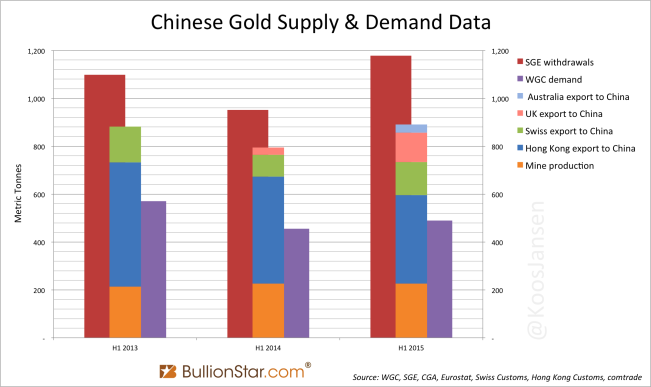 Therefor, in order for us to make the best estimate of true Chinese gold demand we should subtract the amount of distortion from SGE withdrawals. The crux of true Chinese gold demand is establishing the amount of distortion, that’s it. Previously I assumed the scrap numbers by GFMS mainly reflected gold that was making it’s way back to the SGE and these flows included disinvestment. Both assumptions appeared to be false. Scrap numbers from GFMS and MF, although they’re certainly not equal, are collected from refiners that are not all SGE members. Implying not all refineries scrap is making its way to the SGE, but is sold through other channels. 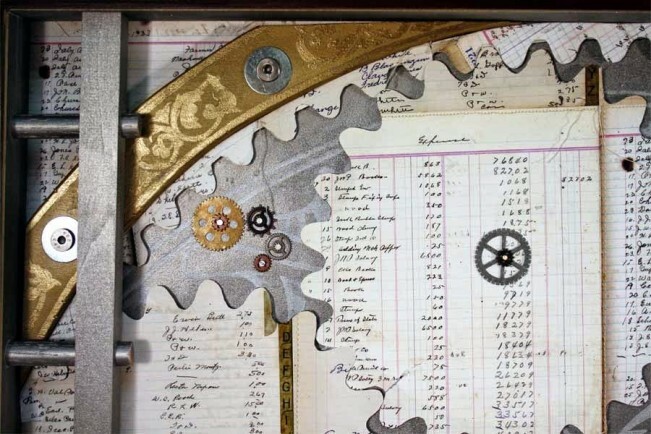 Scrap numbers from GFMS and MF include jewelry and industrial products sold back from consumers, they do not include disinvestment that flows directly through refineries to the SGE. GFMS does measure disinvestment at retail level, for example, when people sell bars back to banks these will get netted out to compute net retail bar demand. But if an affluent investor or institution wants to sell (disinvest) 500 Kg they’re likely to approach a refinery directly. In my nomenclature “distortion2” is the part that inflates SGE withdrawals as a measure for demand, “scrap” is supply from sold fabricated products like old jewelry, and “disinvestment” is supply coming from investment bars sold directly to refineries making its way to the SGE. As a consequence, these new insights regarding scrap and disinvestment supply have changed my perspective on the Chinese supply and demand balance. To reach a more clear understanding of what was just described, I’ve conceived an exemplar graph to visually interpret the Chinese physical gold supply and demand balance. Have a look. As you can see in the graph above total supply and total demand are exactly equal, this is because one cannot sell gold without a buyer or buy gold without a seller. Consequently we can gauge demand by measuring supply. Please note, in the supply and demand balance shown above, and in our further investigation, two elements are left out. On the supply side I left out stock carry over in SGE vaults from previous years, as this information is not publicly available. On the demand side I left out gold bought at the SGE that was not withdrawn from the vaults, as this information is also unknown. 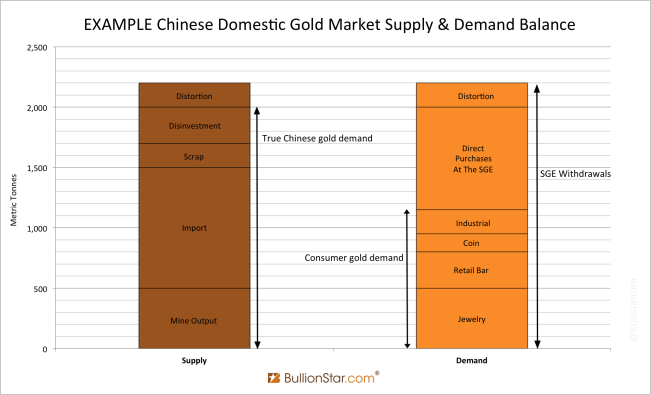 In all its simplicity the example chart shows that the difference between consumer demand and true Chinese gold demand is caused by direct purchases from individual and institutional clients at the SGE. 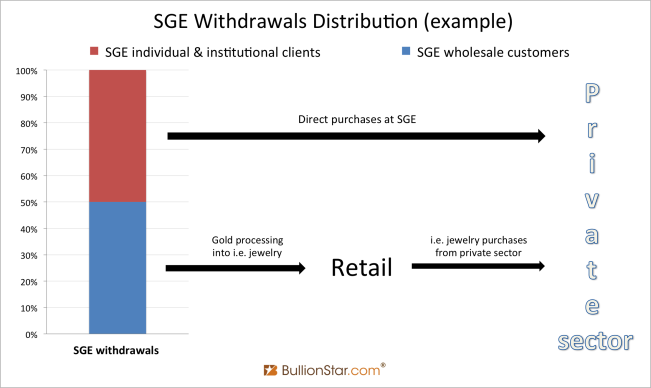 While GFMS merely counts demand at retail level, by jewelry and bar sales at shops and banks, the real action is at wholesale level, at the SGE. GFMS fully neglects direct purchases at the SGE (demand) and any corresponding disinvestment to the SGE (supply). Hence our disagreement. Exhibit 5. According to my analysis the PBOC does not buy its gold through the SGE. For more information read my post PBOC Gold Purchases: Separating Facts from Speculation. At the moment the SGE has almost 10,000 institutional and over 8.3 million individual clients that are able to buy gold directly at the SGE. There is even an SGE smartphone application called “Yijintong” that allows anyone with an internet connection to open an SGE account and trade directly on the SGE wholesale platform enjoying the lowest spreads in China. Furthermore, the SGE counts 183 domestic members and 63 international members. Yijintong has comprehensive functions and advanced systems, which are compatible with various Android and iOS operating systems. Right now, it possesses market, transaction, search and information functions, so investors can conduct transactions via mobile phones … In early 2016, Yijintong will support mobile phone online account opening. 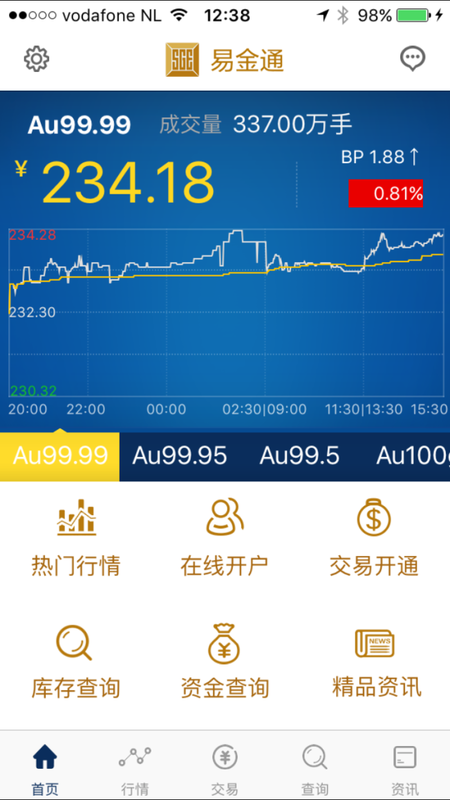 After that, new users will be able to establish Shanghai Gold Exchange’s “Gold Account” business on their mobile phones directly, and avoid the step of visiting stores. It has brought convenience for personal investors to participate in gold and silver transactions. Exhibit 8. Download methods: iOS and Android mobile phone users can scan the QR code and open it in the browser to download and install directly. The China Gold Association (CGA) makes yearly estimates of direct purchases at the SGE. In their Gold Yearbook 2013 direct purchases (net investment) were assessed at 1,022 tonnes, computed as SGE withdrawals minus consumer demand. The CGA neglects any distortion flowing through the SGE hence I stopped using their methodology. Have a look at the screenshot below. Although not all scrap as disclosed by GFMS ends up at the SGE, it’s definitely all genuine supply and therefore useful in the first formula above. Same goes for domestic mine output. The part of scrap and domestic mine output that doesn’t travel to the SGE (although being genuine supply) must be replaced by either disinvestment or distortion at the SGE (exhibit 4). Note, in the knowledge direct purchases from the SGE are immense in China (exhibit 9) we can safely assume that disinvestment flows to the SGE are sizable as well. 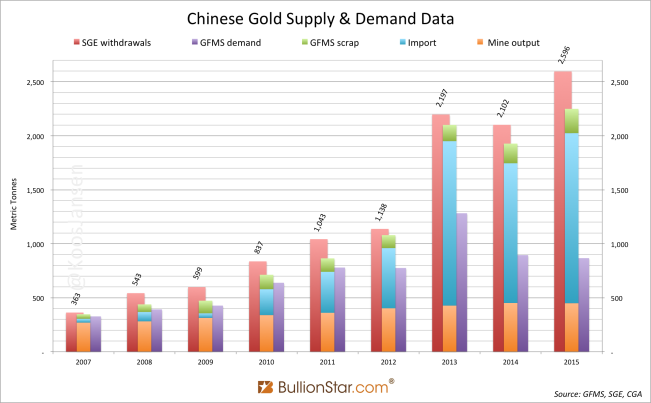 My new insights unfortunately do not imply that we can make a more precise estimate of true Chinese gold demand. However, I think the best approach is to set the lower bound of true Chinese gold demand at net import1 + mine output + scrap. While I think true demand is likely higher because disinvestment to the SGE can be significant. Let’s return to our discussion with GFMS. The big question is of course, how can total Chinese gold demand by GFMS be 867 tonnes, in a market where mining output accounted for 450 tonnes (source), net imports by my calculations accounted for 1,575 tonnes1, and there is also scrap and disinvestment supply, but export is prohibited and the premium on gold in China was positive throughout the whole year?! This cannot be. I would like to show a real life example to illustrate what’s going on the Chinese gold market: In 2015 the Chinese stock market (the Shanghai Composite Index) declined by 40 % from June till August. 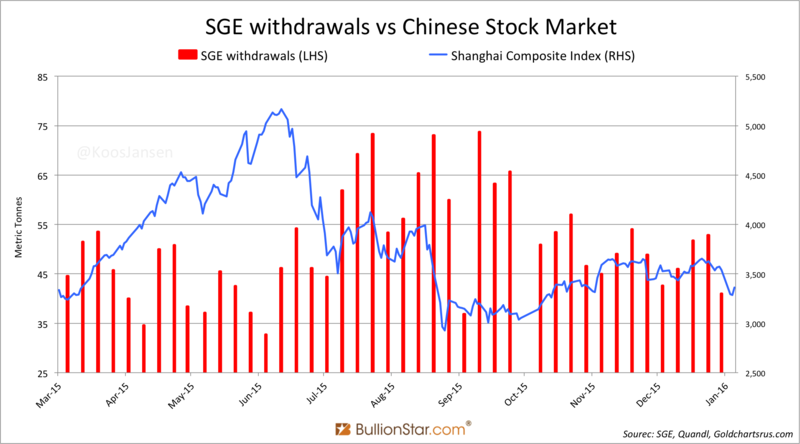 Seeking for a safe haven the Chinese bought physical gold en masse directly at the SGE; some weekly withdrawals in July, August and September transcended 70 tonnes. The gold was of course sourced by imports (look at the premium in exhibit 10), yet GFMS doesn’t consider this to be demand. Although true Chinese demand cannot be less than SGE withdrawals minus distortion, GFMS pretends their arguments can explain the gigantic gap between SGE withdrawals and consumer demand. Illustrated in the chart below. All arguments presented can only explain the size of distortion (exhibit 4), not the difference between SGE withdrawals and consumer demand! Actually, I should stop writing here, but I won’t. Let’s briefly go through these arguments to see if they make any sense. Financial statement window dressing (page 58). Chinese commercial bank assets to back investment products. “The higher levels of imports, and withdrawals, are boosted by a number of factors, but notably by gold’s use as an asset class and the requirement for commercial banks to hold physical gold to support investment products.” (Gold Survey 2015, page 78). What happened to arbitrage refining as described by GFMS Senior Precious Metals Analyst Samson Li at the Reuters Gold Forum in 2015? Has this arbitrage opportunity ever existed or did the market change and now the opportunity is closed? I never thought this argument was very compelling. Maybe GFMS changed its mind on arbitrage refining. 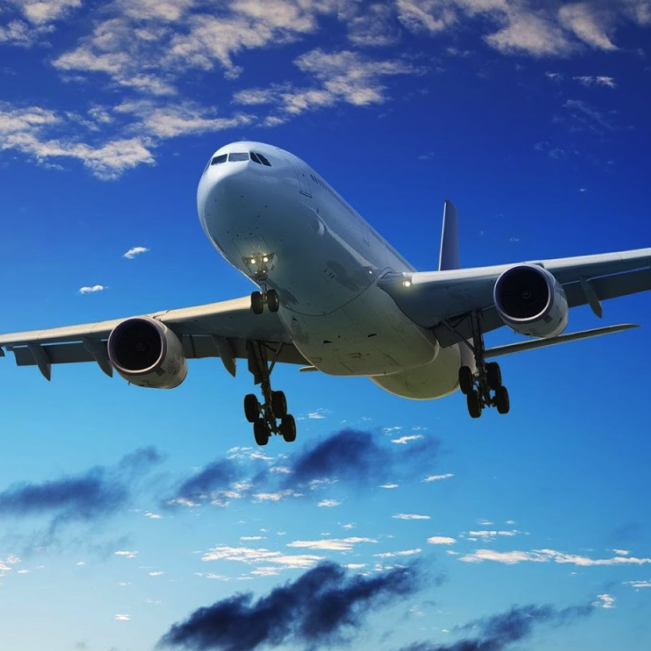 What happened to the round tripping of gold between Hong Kong and Shenzhen, put forward in the Gold Survey 2014 and 2015 as a reason that inflated SGE withdrawals? Did criminals stop using this scheme, or did GFMS find out it never inflated withdrawals because gold flows through Free Trade Zones are separated from the Chinese domestic gold market and the SGE system1? In several posts I’ve extensively shown round tripping does not inflate SGE withdrawals, for more information click here. What happened to the argument Chinese commercial banks buy and withdraw gold at the SGE to back investment products they offer to customers, a practice which boosts import and withdrawals but was not considered demand by GFMS? Or is it demand now, as GFMS dropped this argument from the list? Ok, gotcha. The definition of tax avoidance is that it’s a legal way to pay as little tax as possible. However, the scheme GFMS describes in the GS2016 report is tax evasion, which is highly illegal, and worst case the perpetrator can suffer life imprisonment. This is not some legal loophole as GFMS purports (page 56). We initially became aware of the scheme in 2013 when it first emerged, but based on information gathered from our contacts, the number of industry participants mushroomed in 2014 and 2015 as other traders became aware of the potential loophole. By writing the scheme is a way of tax avoidance and a loophole GFSM is misleading their readers. In addition, this illegal scheme did not emerge in 2013. The tax rules are now the same as when the SGE was erected in 2002. In fact, if you click here, you can read an article about the same crimes in 2009. But as mentioned before, we’ll save the details for a forthcoming post, when we’ll also address “financial statement window dressing” and “retailers selling unsold inventories directly to refiners”. 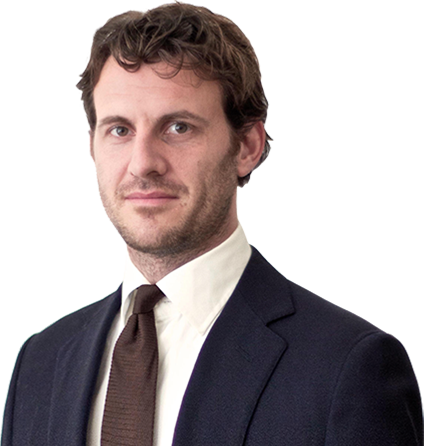 Over recent years we have observed a rising number of commercial banks participating in the gold leasing market. … It’s estimated that around 10% of the leased gold leaves the SGE’s vaults. The majority is for financing purposes and is sold at the SGE [and stays within the SGE vaults] for cash settlement. So, I hope to have clarified why according to my estimates true Chinese gold demand in 2015 must have been north of 2,250 tonnes (import 1,575 tonnes, mine output 450 tonnes, scrap supply 225 tonnes). More details in the next post when we will discuss the tax scheme. 1. Estimating China’s net gold import is difficult. For one, because China’s customs department doesn’t publicly disclose its cross-border trade statistics for gold so we depend on bullion export data (HS code 7108) from the rest of the world. Data from Hong Kong, the UK, Switzerland, the US, Canada and Australia is publicly available, but for example data from South Africa is not. Therefor provisional data on China’s net import is not always fully accurate. Only when the CGA publishes the import amount in their Gold Yearbook can we know for sure. My estimate is 1,575 tonnes for 2015. Net bullion exports to China in 2015: Hong Kong 861 tonnes, Switzerland 292 tonnes, the UK 285 tonnes, the US 6 tonnes, Japan 5 tonnes, Australia 124 tonnes, Canada 3 tonnes. In China gold is not allowed to be exported from the domestic market (SGE Main Board). However, gold is allowed to be imported into / exported from China through processing trade, usually done in Free Trade Zones. This is the only way gold can be exported from China. Note, processing trade flows are completely separated from the Chinese domestic gold market. For detailed information read my post Chinese Cross-Border Gold Trade Rules. In order to track how much gold China is net importing, it’s necessary to net out bullion export to China by foreign countries, with import from China by foreign countries (HS code 7108). Although, it’s also possible that bullion is imported into China through processing trade and exported as jewelry (China has a vast jewelry manufacturing industry), which falls under a separated trade category (HS code 7113). Suppose, a jewelry manufacturer in Shenzhen import 2 tonnes of gold from Hong Kong under HS code 7108 through processing trade, processes the gold into jewelry to subsequently export the finished products back to Hong Kong under HS code 7113. This would blur our view on net bullion import by China, however I neglect this phenomenon in my calculations. The fine gold content in jewelry exported from China (HS code 7113) is very difficult to measure as the total value of the products shipped also contain other precious metals, gems and includes the fabrication costs. Hence, the value and weight of jewelry exported from China does not reveal the fine gold content. The reason why I do not adjust net bullion inflows into China by jewelry outflow is because the gold content in jewelry exported from China is roughly offset by imports of gold doré or gold as a by product in ores and concentrates. For example, the most recent CGA Yearbook in my possession, covering calendar year 2014 (exhibit 13), states “Chinese domestic and overseas gold mining output” was 512.775 tonnes. In the same report it’s mentioned “domestic mining output” accounted for 451.799 tonnes, implying overseas mine supply accounted for 60.976 tonnes. And thus, I net out overseas mining imported into China (60.976 tonnes) against jewelry exported from China. If I find more information on Chinese cross-border gold trade flows I will adjust my methodology accordingly. Exhibit 13. Screenshot taken from my hard copy of the CGA Yearbook 2014. We can see framed in blue is “domestic and overseas mine supply”, framed in red is “gold import” and framed in green is “total supply”. Total supply, as disclosed by the CGA, equals SGE withdrawals for 2014, likewise it did for the years 2007, 2008, 2009, 2010, 2011, 2012 and 2013. 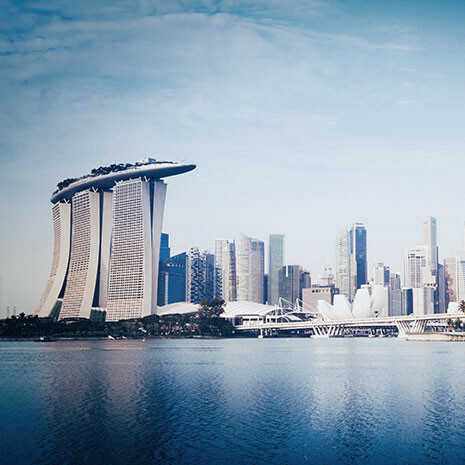 Last but not least, gold can be imported through processing trade into the Shanghai Free Trade Zone (SFTZ) where the Shanghai International God Exchange (SGEI) vaults are located. Potentially, this gold in SGEI vaults, once sold to foreigners is withdrawn and exported abroad (inflating SGE withdrawals). However, a source at ICBC has indicated to me that regarding physical flows the SGEI is mainly used by Chinese domestic banks to import gold into the Chinese domestic market, at least this was the case until December 2015. So I don’t see a possibility there were exorbitant large volumes of gold in SGEI vaults in 2015, or have been withdrawn and exported. The only noteworthy imports from China (the SGEI) I have observed are by India, which has taken in 370 Kg during 2015 (source Zauba), and by Thailand that presumably bought 7 tonnes (source COMTRADE). Exhibit 15. 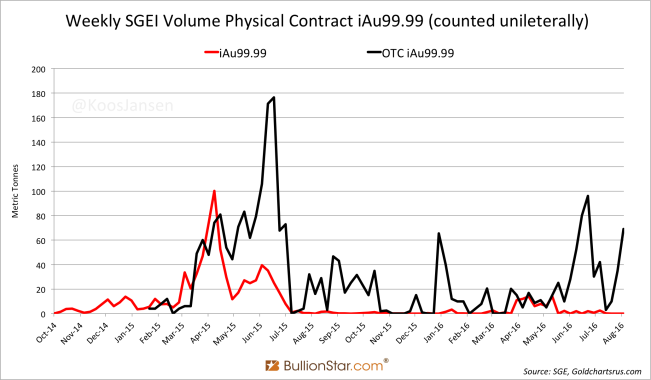 Weekly trading volume of the most popular SGEI contract iAu99.99, traded on-exchange and in the OTC market. For more information on the SGEI read my posts, Workings Of The Shanghai International Gold Exchange and What Happened To The Shanghai International Gold Exchange? 2. For the sake of simplicity I have categorized under “distortion” everything that is not true demand, namely: process scrap, stock inventory change, arbitrage refining (if it exists), the VAT scheme, smuggling and SGEI withdrawals.